This 4 star hotel is located in the city centre of Oulu and was established in 1989. It is close to the The Science Centre and the nearest station is Oulu. The Hotel has a restaurant, a bar, a conference room, an indoor swimming pool and a fitness centre/gym. 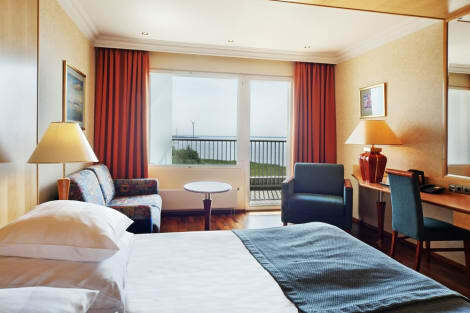 All 154 rooms are equipped with minibar, hairdryer, safe, ironing set and air conditioning. Make yourself at home in one of the 222 individually furnished guestrooms, featuring minibars and LCD televisions. Your memory foam bed comes with premium bedding. Complimentary wired and wireless Internet access keeps you connected, and digital programming provides entertainment. Private bathrooms with shower/tub combinations feature complimentary toiletries and hair dryers. Make yourself at home in one of the 260 air-conditioned rooms featuring minibars. Complimentary wireless Internet access is available to keep you connected. Bathrooms with bathtubs or showers are provided. Conveniences include phones, as well as safes and irons/ironing boards. Located in Oulu, Break Sokos Hotel Eden is by the sea, a 1-minute drive from Oulu Beach and 9 minutes from Tietomaa. This 4-star hotel is 3.1 mi (5 km) from Oulu Market Square and 3.1 mi (5.1 km) from Oulu Cathedral. A stay at Scandic Oulu City places you in the heart of Oulu, within a 5-minute walk of Toripolliisi Statue and Oulu Market Square. This 4-star hotel is 0.4 mi (0.7 km) from Mannerheim Park and 0.6 mi (1 km) from Oulu Cathedral. lastminute.com has a fantastic range of hotels in Oulu, with everything from cheap hotels to luxurious five star accommodation available. We like to live up to our last minute name so remember you can book any one of our excellent Oulu hotels up until midnight and stay the same night.